Walmart seems to be feeling a bit squirmy about the upcoming Black Friday sales at its stores in light of workers’ plans to protest at over 1,000 stores nationwide, and has filed a complaint against a union it says is involving itself in the brouhaha even though it’s not the workers’ official union. Black Friday is The Main Event as far as the company is concerned, and it doesn’t want any strikes or picket lines to muck things up. The Wall Street Journal says Walmart filed an unfair-labor-practice complaint las week with the National Labor Relations Board seeking an injunction against the United Food and Commercial Workers International as a result of worker rallies and pickets that have taken place at stores and warehouses in the last six months. Workers who are part of the protests against low wages, short hours and poor working conditions are members of OUR Walmart (Organization United for Respect at Walmart) and Walmart says the UFCW is in cahoots with that group. The UFCW helped OUR Walmart at its inception in 2010 with money and advice. 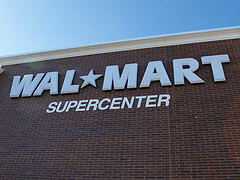 But the UFCW says OUR Walmart is “its own nonprofit organized by Wal-Mart workers and funded through dues that are voluntarily contributed,” said a UFCW spokeswoman. CNN says the complaint by Walmart alleges that UFCW is trying to force the company into collective bargaining, even though it isn’t the official union for Walmart employees. The complaint also says the workers are violating the National Labor Relations Act which says workers can’t picket for over 30 days without getting a collective vote and filing a representation petition. “If [the store employees] are scheduled to work, we expect them to show up and do their job. If they don’t, depending on the circumstances, there could be consequences,” said a company spokesman, adding that those who are planning to walk out are a very small minority of its 1.3 million employees. He says Walmart is ready for the “Superbowl” of retail on Friday. OUR Walmart says that the protests aren’t about supporting unionization but instead are meant to highlight the retaliation against workers it says happens when employees complain to Walmart about working conditions and pay. Time will tell — and it’s only a few days before Black Friday. Sounds like the National Labor Relations Board has quite a bit to consider before the big day.